Wow long time no post, well for me that is. I still have so much to catch up on. I wanted to share a great link for all my fabric lovers out there. With the economy the way it has been we all need a little break here and there. I want to share with you a group on yahoo that I am in called a fabric co-op. This is basically a group where you can buy fabric at wholesale prices, as well as bulk. We just closed an order for some park slope and Amy Butler closeouts at 3.50 - 4.50 a yard. That is great huh. Also I made these a few days ago but since Sarah wanted to see them I thought I would show you all to. The picture above I made for my fabric shopping trip this weekend. Pattern is Jane's Market bag. Fun to make and pretty easy for beginners if you would like to give it a try. Fabrics used are Denyse Schmidt's county fair Home Dec collection. The bags look great! Thanks so much for the info and link to the co-op. I'm heading over there now. I so appreciate our online quilting community! I am so excited to know about this. Thank you!! Love the bags. Love the fabric you used too. I signed up for the group. 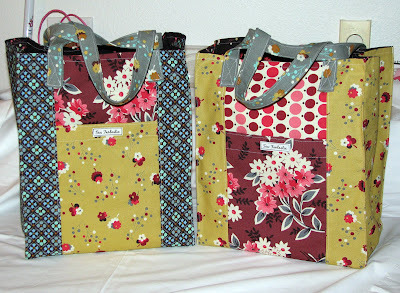 The bags are great, love the fabrics. And thanks for the link!